Heinz Neddermeyer was a German citizen born about 1915. 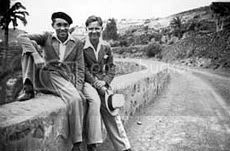 He is also considered to be the first great love of writer Christopher Isherwood. Heinz and Christopher met in Berlin on March 13, 1932 when Heinz was 17. Christopher would often describe their relationship as an adoption, being the Heinz was so much younger and not entirely mature. The couple lived together in Berlin until May 1933 when, due to the uprising of Hitler, they were forced to flee the country. The photograph at right is of Heinz (left) and Christopher (right) during this time. They traveled Europe and North Africa until May 12, 1937 when Heinz was expelled from Luxembourg and forced to return to Germany. The next day he was arrested by the Gestapo and sentenced to three and half years of forced labor and military service. He survived the forced labor which was brief. Being conditionally free, he married a woman named Gerda in 1938 and had a son named Christian, his only child, in 1940.